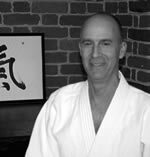 Steve has been training in Ki Aikido since 1991, and has been the Head Instructor of Five Rivers Ki-Aikido since 1998. 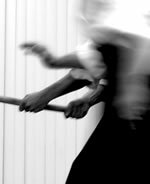 He currently holds the rank of Sandan in Shinshin Toitsu Aikido and Shoden in Shinshin Toitsudo. He is also a Qualified Assistant Examiner in Ki Aikido. He is the founder and president of Zimmerman Marine, a boatyard that builds and maintains high quality cruising yachts. Steve has logged several thousand miles on the water, including the entire East Coast from Canada to the Caribbean, and over forty trips between the Chesapeake Bay and Long Island Sound. He has raced, cruised, and worked as a paid hand and captain. Steve has been building, repairing, and sailing boats for more than 30 years. June 8-10, 2012 here. Get the PDF flier here.